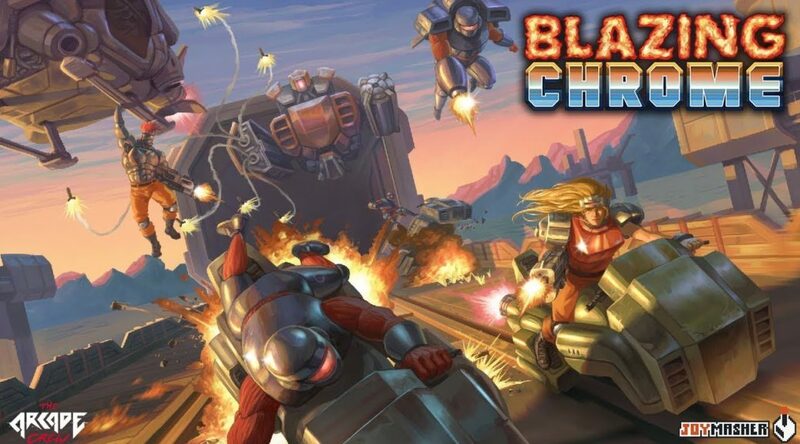 The Arcade Crew and Joymasher have announced the launch window for retro-inspired co-op battle title, Blazing Chrome. Blazing Chrome will be released on Nintendo Switch eShop in early 2019. A special Blazing Chrome T-shirt will also be available in Travis Strikes Again: No More Heroes. Publisher The Arcade Crew and developer Joymasher today reveal Blazing Chrome, the retro-inspired co-op battle to save Earth from the rule of merciless AI, will take the fight for humanity to the Nintendo Switch, PlayStation 4 and PC when it launches in early 2019. A new gameplay clip debuted with the announcement, sharing a fresh glimpse of the devastated environments awaiting action fans eager to fight for a brighter, less mechanically-dominated future. Players will need a steady aim as they plow through a warzone, utilizing tide-changing power-ups, powerful exosuits, and an arsenal of futuristic weaponry to stay alive on the battlefield. Blazing Chrome is a throwback to the golden days of side-scrolling shooters with modern touches ensuring its gameplay feels as precise as it does authentic to the era it channels. Players can tear through six highly-varied stages filled with deadly, bullet-spewing AI as Mavra, a lone human resistance fighter, or the rebellious robotic insurgent Doyle.